Okay, I know a lot of people will be quick to argue this, but before you get a chance I want to say I agree with you. Things change. But there's one thing I saw in a YouTube comment, of all places, that actually made a load of sense on this subject. Really, roads belong to cyclists and we're the ones borrowing them. 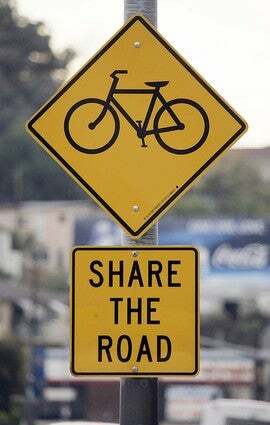 While there are freeways and other fast/large roads that do not allow bicycles, the rest belong to them. See, as drivers, we do not have a right to the road. Just a privilege. We need a license and our cars need to be registered. Bicyclists need to be a certain age in some places, but other than that there are no restrictions as to whether or not they can ride. They have a right to the road. And I think that they should. I also think that bike lanes should be more commonplace, as it seems that this is the reason many drivers think bikes belong on the sidewalk (which is almost always illegal, actually) and will get extremely aggressive toward road-going cyclists. The concept of a bike lane makes those who are ignorant to the law feel that bikes are only allowed on the road if there is a bike lane. In reality, they just reduce congestion in bicycle-heavy areas by giving cars the room to pass without moving over. That's why there should be more of them. So yeah. Some cyclists are assholes who ride in the middle of the lane and don't let cars pass, but some drivers are also assholes by refusing to move over or slow down as they fly by just inches from brutally obliterating what they forget is a human being. Just keep in mind that bicycles are more entitled to the road than you are, and hopefully soon society will finally begin to more properly accommodate cars by adding bike lanes. It sounds so backwards to put it that way, but it really is true.